Throughout history, the best proof of the victory of the samurai, samurai or ashigaru which could give to his master, was captured as a trophy severed head of the enemy. The tradition of collecting and amputation was common goals throughout the history of the samurai. This custom is probably rooted in folk traditions and religious beliefs of the Japanese. 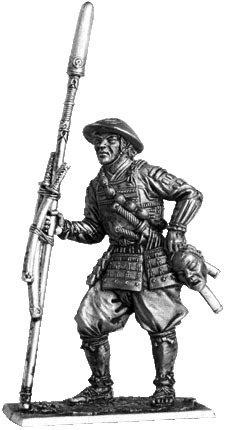 Foot soldiers-ashigaru who showed courage and bravery in battle, could count on the rewards and promotions. Opportunity to show themselves traditionally boiled down to the number of captured enemy heads. Entering the battle, loyal and brave ashigaru thought whether he can get the head of the enemy, or, conversely, he will lose his life? In the words of Tokugawa Ieyasu before the battle of Sekigahara in 1600, only two exits: either go back to the bloody enemy's head, or the most left without a head. Ieyasu was a great expert in this matter. His people made ​​it to closely monitor the hairstyle and hair before the battle smoke of incense, so that their severed heads were clean and nice view. Also encouraged the samurai to let his mustache so that their heads are not mixed up with women. Procuring a valuable head, the warrior tried to leave the battlefield, convinced that his duty fulfilled. Commanders sometimes had to give special orders prohibiting behead directly during the fight, not to be distracted from the main objective of battle. Warrior, decapitated corpse thrown into a nameless, was the target of scorn, and the heads of simple Ashigaru, chopped off in the heat of battle, often not taken into account. After the battle was conducted to collect and sign these horrible trophies. Then the ceremony of contemplation heads. The winning daimyo beheld them, sitting at a rate in an environment closest samurai. Before this ceremony the head thoroughly washed, combed their hair, tinted face makeup and set on special plates with sharp points. This routine work usually performed by women. Then, for each head attached paper label, which bore the name of the victim and the name of a brave warrior, dobyvshego trophy. If you do not have time to properly prepare for the ceremony, the heads were exhibited at the battle unfolded fan, the laid cloth or leaves to soak up the blood. Contemplation of the goals could be delayed and timed to any holiday. Thus, the highlight of New Year's feast, arranged Ode Nobunaga in 1574 became the head, seized the previous year and survived thanks to the fact that they are covered with lacquer and sprinkled with gold powder. Ashigaru clad in armor from inexpensive thin lacquered steel or leather. Such armor style okegawa-do and has thousands of named okasi-gusoku ("borrows armor"). A short hand spear (moti yari) is on the tip of the wooden lacquered scabbard. Ashigaru obtained a valuable military trophies: a pair of swords, which he tied to the stele, and the severed head of their former owner. Notify me of updates to Ashigaru with trophies, 2nd half of XVI - early XVII century.